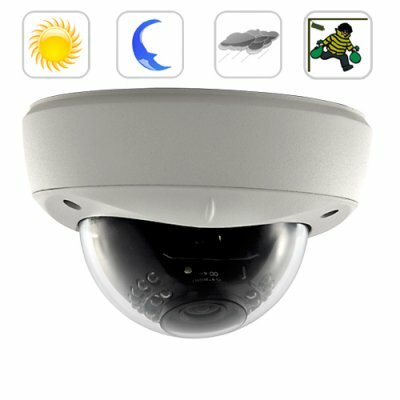 Successfully Added Security Camera (Sony Interline CCD, Night Vision, Vandalproof) to your Shopping Cart. New super Security Camera with Sony Interline CCD with Vari-Focal Lens, night vision, superior 3-axis design, and heavy gauge die-cast housing with polycarbonate dome lens for the best in vandal resistant construction. Protect your home or business with this durable, ultra high quality outdoor/indoor security camera with advanced Sony Interline CCD video imaging sensor. Anyone concerned about security will appreciate this durable, weatherproof video surveillance camera. With a clear 520 TVL resolution and an ultra clear long viewing range, this powerful camera is perfect for keeping an eye on the outside or inside of your business all day and night, rain or shine. With 360 degrees of pan and tilt 3-axis adjustment, you will never miss anything when the I54 Security Camera is installed on your premises. With a Sony Interline CCD that gives a high quality image and wide viewing angle plus 30 infrared (IR) LED's that provide excellent nightvision, even in complete darkness, your security team will never miss anything. This new OEM Video Surveillance Camera actully gives you the same exact performance you get from a Samsung, Panasonic, Vitek, IQ or Messoa CCTV security videocamera, but gives it to you in a factory-direct wholesale price. This OEM Security Camera is actually half the price of the same exact Vandal Proof Security Camera models from the "name brands". For maximum home and business security, nothing beats the I54 Security Camera for improved safety and peace of mind. For all your Security and Surveillance Equipment needs visit us at chinavasion.com. Maybe. If you live in the U.S., Canada or Mexico, then first check to see if your TV or monitor can switch between PAL/NTSC. If your TV or monitor does have this option, then you can use this camera. This is a CCTV Security Camera, it is not wireless/cordless. You will need to connect cables from the camera to the computer, monitor or TV screen.